Launched at the Basel fair in 1950, reference 6062 was the first automatic wristwatch with date and moonphases to be housed in a waterproof case. 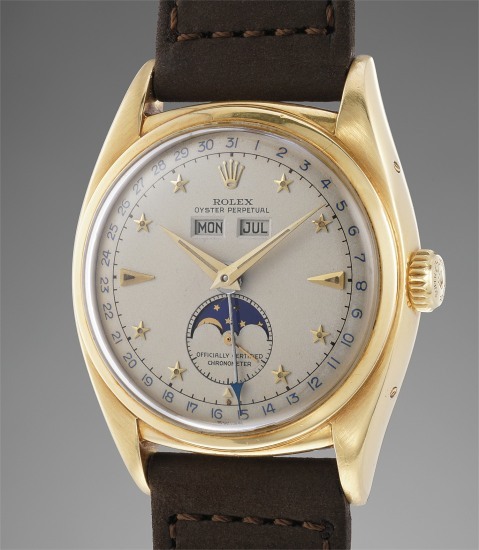 Cased in stainless steel, yellow gold and pink gold, the model was fitted with a number of dial variants. One of the most iconic versions is without a doubt, one fitted with eight faceted stars in lieu of hour numerals, such as the present watch. Such is the desirability, and popularity of the watch, that collectors have dubbed it "Stelline", meaning "starlet" in Italian. Reference 6062 is one of two Rolex models to feature a triple calendar complication with a moon phase complication. While reference 6062 features a screw down Oyster caseback, reference 8171 features a snap-on caseback. Few watches cause fervor and excitement among collectors like reference 6062 and 8171 can. While Rolex is particularly known for its sports models, such as the Submariner or Daytona, the manufacture has created some of the most sublime triple calendar wristwatches in the world. Over the years, these two models have garnered a cult-following, with condition being prized above all. The present "Stelline" is preserved in impressive condition. Most examples are spotted throughout, due to aging and exposure to environmental elements. Yet, this dial barely has any imperfections. The numerals on the outer track are inky blue, and the day and date apertures are sharp and angular, demonstrating the originality of the dial. The luminous dots have aged evenly with the numerals, both having aged with warm patina. The yellow gold case, preserved in excellent and sharp condition, displays a sharp hallmark to the bottom of the lug. Of particular note is that caseback engraving bearing "S.W Levitan Wash. D.C." Research shows that Simon W. Levitan was an accountant for more than 50 years and the former president of the D.C. Board of Accountancy. On top of his many achievements, he was even a special agent during his lifetime. Fresh to the auction market, the present watch has resided in a private collection for many years. Rarely does this model come at auction, no less in such desirable and impressive condition.